As-salamu alaykum and hello everyone ♡. Yeay! ANother Yadah product review! Any Korean cosmetics fan here? Raise your hand! I have review quite a number of Yadah products didn/t I? Wanna see the previous review of all Yadah products? Click here, link. 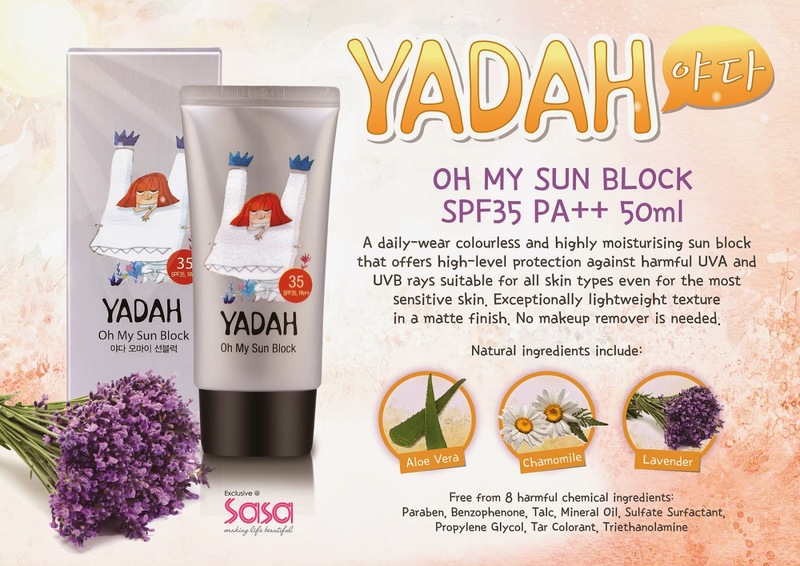 So recently, Yadah have launch a new product and it is a sunscreen! From what I can recall, Yadah have a sunblock product in their previous product collection. the one that comes in a white tube and orange cap. I have tried that but I don't really like it. Its too thick to my preference. So I guess this is a all new and improve sunscreen that really wow me! As you know Yadah practice all natural and chemical free product. So that is very good. Presentiong to you, the new Sunscreen you guys have to own, The Yadah Oh my Sunblock in spf 35++! What it claims to be different from other sunscreen is that it is 100% colorless and transparent (zero color pigments) which means no makeup remover is need, highly moisturizing, fast-absorbing, non-tinted, non-sticky and non-greasy. YADAH Oh My Sun Block has an exceptionally lightweight texture in matte finish, it feels like you’re wearing nothing at all. Safe to use on skin even for children. Yeap. I got to admit that all of this are TRUE! My thoughts. I love this sunscreen! I got to say, I never tried any sunscreen like this before. Some of the sunscreen i have tried before was okay. Some of them are heavy and greasy, I toos it out. Some of them were not greasy but a little powdery (too matte). Some of them are okay, but the smells of the "common sunscreen" scent buzz me off. So, Yadah Sunblock does not even have those disadvantages. Yes, its light weight, and DO NOT HAVE THAT SUNSCREEN SCENT AT ALL! I was surprise when I first use it. I love the scent of this product too, it reminds me of the Yadah Bubble Cleanser scent. Citrus and fresh lemon'y scent. As you applying it, it really feels like a moisturizer, it absorb pretty fast and does not leave a white cast finish and does not feel greasy. This only part that i don't agree is the matte finish that they claim. It does not gives you a matte finish but it does not leave your face look greasy. Pretty much in between. Good for everyday use and before applying makeup! I really recommend this sunblock to young girls who are looking for a good sun protection product. The price is a little high for young girls to my opinion, but a pea size amount of this can cover the whole face. It is free from harmful chemical which is a good product for young girls out there. 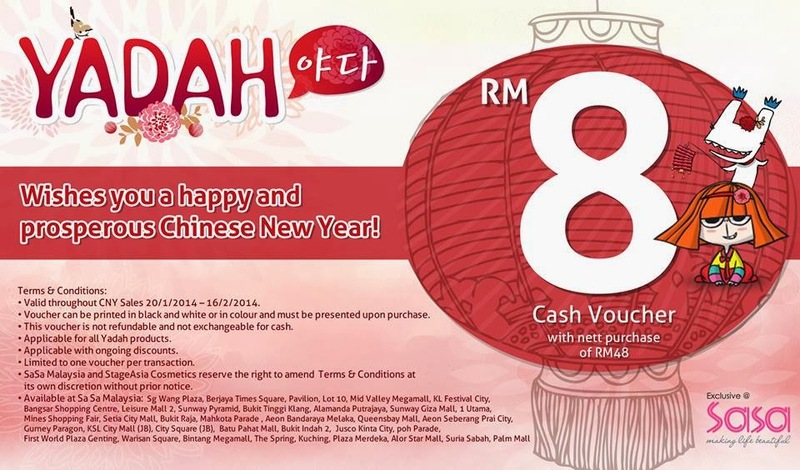 Just print this voucher to enjoy a whopping RM8 off with any purchase of RM48 and above from Yadah Malaysia. Have you find your perfect Sunblock? oh that one is a lil thick for me, i think this one much more improved and nicer! Yeap, its so typical to all sunblock product to its greasiness and how common they smell.